In March we launched the fourth minor release for Univention Corporate Server 4. The current version 4.4 offers a number of new features, as well as increased security and more convenience. In the blog article UCS 4.4 Release – Admin Diary, Self Services and Windows Domain Trusts we discussed the highlights of the new UCS version. With this article we will now demonstrate how easy it is to update to the new UCS – depending on your personal preferences either through the Univention Management Console (UMC) or using the commandline. First update the Domain Controller Master, which maintains the authoritative version of the LDAP directory service and replicates it to all other LDAP servers in the UCS domain. After the upgrade of the DC Master is completed, upgrade the remaining UCS systems (Domain Controller Backup, Domain Controller Slave or Member Server). 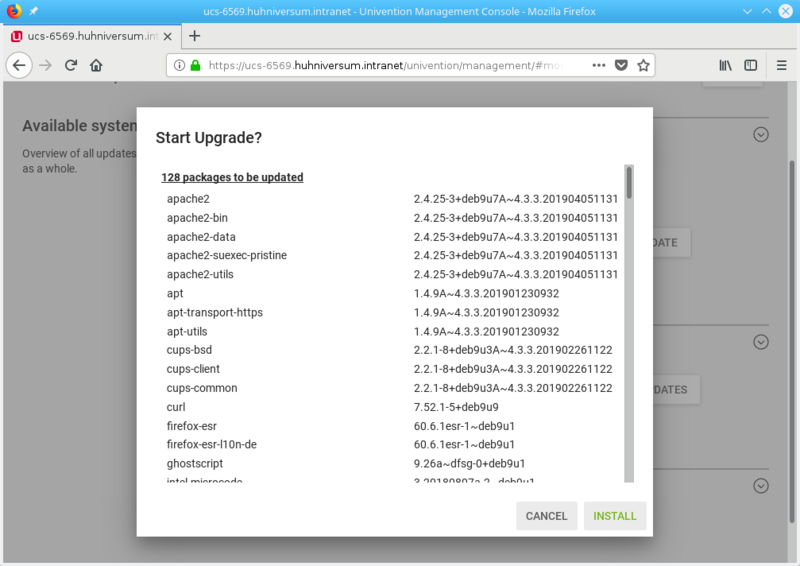 Whether you upgrade from the Univention Management Console or from the commandline, the procedure remains the same: First, update the software of the running UCS system (update existing packages), then upgrade to the next UCS version. 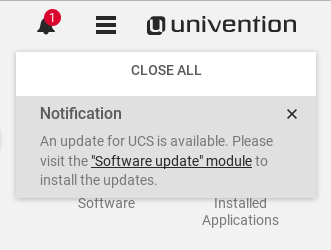 Whenever there are new versions of currently installed packages or apps or a new UCS release, notification area in the the Univention Management Console notifies you. A click on this message will take you directly to the correct module (Software update). In order to update all existing packages, scroll to Package updates and click the Install Package Updates button. After a short time, a small dialog box will appear listing the renewable packages. A click on Install starts the update. Click Install Release Updates to start the upgrade. A dialog box shows some guidelines for the upgrade, such as leaving the system running during the upgrade. You can also use this dialog to access the official release notes and the Univention Forum. Depending on the bandwidth and speed of the system itself, the upgrade may take a while. Again, you will need to confirm the system reboot. If access to the Univention Management Console is not possible (or you prefer to use the shell), you can upgrade to the next UCS version with a single command. To do this, log in as root user and run univention-upgrade. Note: It is not recommended to do the upgrade via SSH, as the network connection may break down during the upgrade. If you want to upgrade a remote system, log in via SSH, run the screen tool, and then start the univention-upgradetool. This allows the upgrade to continue even if the SSH connection is being interrupted. Simply log back in and reactivate the session using screen -r.
After starting univention-upgrade, the script first shows which UCS version is already installed. A verification of the package sources follows. If package updates are available for the current system, install those first. Confirm the request with y, followed by [Enter]. As soon as all packages of the running system are up to date, the script checks if there are new app versions. You can either install them directly (by entering y) or after upgrading to the new UCS version via the Univention App Center. The next step is to upgrade to the new UCS release. The script displays links to both the German and English release notes and also checks whether there is sufficient disk space. After the upgrade has finished, the script checks if there are upgradeable packages for the new UCS version, and imports them after you enter y. Once the upgrade is complete, reboot the system. If you enclounter problems during hte upgrade (or if you’are simply interested in some background information) take a look at the log file /var/log/univention/updater.log. Xou need root privileges to view the log. In the Univention Forum, users and developers discuss the new release and its features. Search for 4.4 to filter for related posts. Also, feel free to ask your own questions in the forum. Christina studied technical informatic (specializing in automation technology) at the University of Applied Sciences in Bremen and supports UCS users excellently in all questions concerning the commissioning and use of UCS.